One way to start a new rose plant is to clip a section from an existing rose bush and plant the cutting. If the original rose bush, referred to as the parent plant, is a patented variety, you are required to pay a royalty fee to the entity which holds the patent. Seventeen years after patent introduction, a gardener is able to use the cutting without paying the royalty fee. Before taking the cutting, always sanitize the gardening shears to avoid spreading any disease. 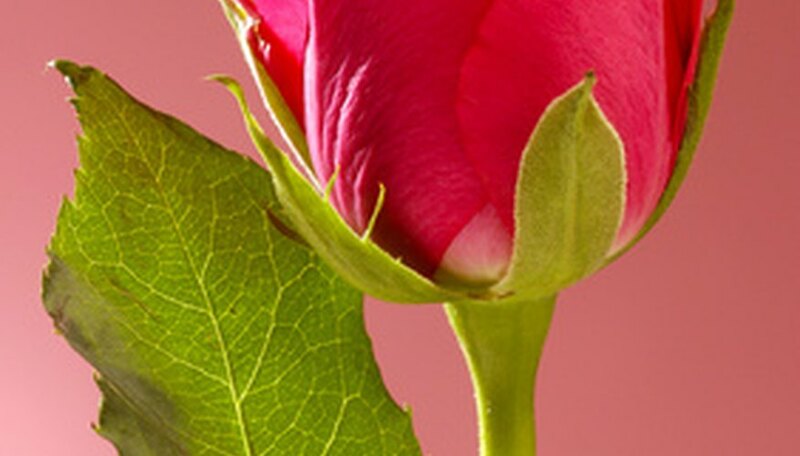 Select a healthy stem with a flower on the tip and two or more five-leaf leaflets attached. Wait for the flower to come to full bloom before taking the cutting. Cut about 7 inches of the stem from the bush, cutting at a 45-degree angle. Snip most of the foliage from the stem, leaving two five-leaf leaflets (closest to the rose) on the stem. Cut the rose from the stem tip. Fill a pot with two parts sand and one part peat moss. Insert the stem straight down into the soil mixture, burying 1/3 to 1/2 of the stem in the medium. Keep the stem tip above the soil line. Water thoroughly. Keep the container in bright light out of direct sunlight and keep the soil moist. The new rose bush will be ready to plant at its new location in the garden after summer, in the fall or winter.